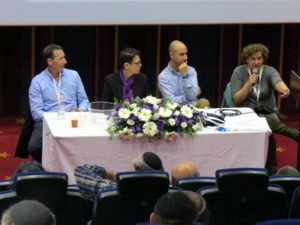 MEGAComm is the yearly conference for technical communicators, Marcom professionals, and content managers in Israel. MEGAComm is about networking, sharing and learning about the latest trends in the industry, and spending an enriching day among your peers. Our rich program presents sessions in three concurrent tracks for you to choose from. This is our 13th annual conference. Each year, it is exciting to be able to offer a wonderful day filled with presentations by some of the leading experts in their fields. Hundreds of hi-tech professionals from a wide variety of industries – telecommunications, mobile technologies, security, commerce, television, hardware, and so much more. Many of those who attend are corporate decision makers in their companies, department leaders, MARCOM managers, small and medium-size business owners. Most represent Israel’s hi-tech industry – companies that are looking for the latest methods and tools to streamline their documentation. Our attendees came from all over Israel – from the far north to many places in the south – central Israel, Jerusalem. They represent dozens of hi-tech companies – from multi-national corporations with offices around the globe, to small teams of writers and MARCOM professionals looking to help their company grow, and freelancers. Our attendees represent dozens of hi-tech companies – from multi-national corporations with offices around the globe, to small teams of writers and MARCOM professionals looking to help their company grow, and freelancers. Attendees come from most of Israel’s largest companies: BMC, HP/Mercury, Amdocs, IBM, RSA, Check Point, ECI, Microsoft, Intel, SAP, AT&T, NDS/Cisco and many more. They are marketing professionals, technical writers, graphic artists, engineers, web designers, translators, and other professionals in the exciting arena of Israeli tech. Each year we are honored by major movers and players in the industry who not only sponsor the event, but send representatives to offer sessions and who are available to speak with you throughout the day. The conference includes lunch and refreshments. There will be three concurrent tracks and breaks between each for networking and visiting the vendor tables. Hours of the conference: 8:00 a.m. (registration) to 6:00 p.m.
You can reach us by phone – Sun – Thurs from 9:00 a.m. to 3:00 p.m. at 02 571-6668 or 058 571-6668. All payments should be made to WritePoint Ltd.
Credit cards are accepted via the office phone only. Call the office for details on bank and PayPal accounts or write to info@megacomm.org.